Here is a large jar of spicy Korean barbeque sauce that we enjoy very much. The flavor has a nice spicy heat from red chile, and sweet tones from apple and pear. As shown in pictures below, we grilled a nice organic chicken breast over charcoal in our Tao barbeque. The result was fantastic. The chicken was marinaded for a few hours, and we scored the chicken with a knife to get the sauce to penetrate deeper into the meat. Slowly cooking over charcoal resulted in a tasty chicken breast with a lovely reddish color (as shown). The marinade is for chicken or pork. Packed in a glass jar, CJ Brand. 17 oz is enough to marinade about 5 lbs of meat. Ingredients: red pepper paste, corn syrup, soy sauce, sugar, red pepper mix (water, red pepper powder, salt, garlic, paprika, glucose, ginger, sodium acetate, fumaric acid, sodium metaphosphate, fatty acids, dextrin), apple puree, pear puree, water, salt, garlic, cooking rice wine, msg, black pepper powder, ginger extract, citric acid, xanthan gum, roasted sesame seed, paprika, capsicum. Product of S Korea. 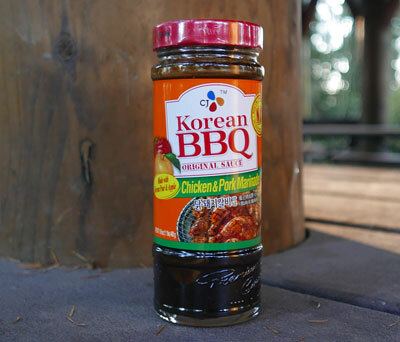 We also offer Lee Kum Kee Korean Barbecue Sauce.